Recipes For Tasty Vegan Protein Balls. Just about everyone loves a sweet snack!!! Especially one that packs an almighty plant based protein protein punch!! But the sad fact is, most packaged health snacks now days (even if advertised as a health food) are no better than junk food. – they contain all kinds of bad fats, sugar and white flour. The only way you are sure to know it is a healthy snack is if you create the batch yourself!! Protein has been recognised as a muscle building and repairing aid, and is also one of the main nutrients to keeping hunger at bay, but vegans often wonder how they can fit this into their diet. Luckily, there’s a very tasty solution – protein balls! The recipes below are all balls are all vegan and contain no refined sugars. ALl of these recipes require no cooking and are easy enough for kids to make? Be creative, use your favorite ingredients, but most of all enjoy them. 1 scoop of Ve-POWER Cocoa Mint protein powder. lend the first 2 ingredients in a food processor, until they are combined and smooth in texture. Place the additional ¼ cup of coconut onto a tray. Roll the apricot mixture into balls, about a heaped teaspoon per ball. Place the balls onto the tray where you put the additional coconut. Shake the tray back and forth until all the balls are covered in coconut. Serve straight away or place the apricot balls into an air tight container and refrigerate. 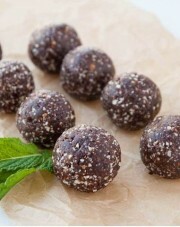 Either leave the balls as they are or roll in coconut or cacao or cocoa or drizzle with melted dark chocolate. Place in the fridge to set. Add the dates and 1 tbsp water to your food processor and process until the dates are broken down. While it's running add in oats, coconut, cocoa powder, and protein powder. Continue to process until it starts to turn into one big clump. It should be a little tacky, but not sticky. If it seems dry add in a little more water, if it's too wet add in more oats. Add the cacao nibs and pulse until they are distributed in the mixture. 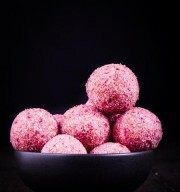 Using a tablespoon, scoop the mixture and roll into balls with your hands.